Check what sort of plastic you can recycle at home. Many councils won’t take anything apart from plastic bottles. A few places do take more and we just found a London trial at certain collection centres to take food trays and other plastic items. Our clothes are designed for multisport lovers like ourselves. That’s why our performance top range is called ‘everywear’. We just took some shots of people actually wearing our clothes for the product pages and marketing. We’re going to put some of the pics that didn’t make it on to the online photo gallery next week. Following all the fun we had at Hyde Park, we’ve decided to do the Metro Ski & Snowboard Show at London Olympia. This is fantastic show and we’re really excited about it. Our clothes are designed for multisport use, so a Long Sleeve Everywear top is at home as a skiing baselayer as it is for an Autumn run. We’re running a competition to Win Free Tickets to the show and other goodies. 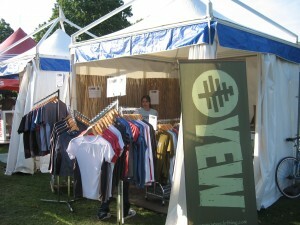 You can find it at http://www.yewclothing.com/skishow or on our facebook page. We’ll have more details on the show in the next newsletter, but our stand (number 840) is right next to the 50ft kicker. We’ll also have some friends on the stand (think beautiful wood snowboards and skateboards, and natural winter health products). More on this closer to the time. If you want to book discounted tickets, please use code YEW when booking through Metrosnow. Last month, Yew were at the ITU World Championship event in London. We had loads of fun showing people our clothes and meeting some lovely people. We even had the Head of Sustainability at London 2012 stop by for a chat – and so did one of Jun’s athletics heroes, Iwan Thomas, the British 400m record holder. We’re keeping our 15% offer open to our friends on the mailing list. All you need to do is enter the code AUTUMN at checkout. Check out the long sleeve range and our fleece jackets as the weather gets colder.